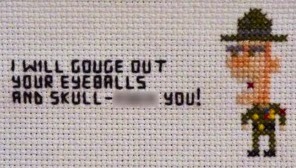 Another great cross stitch from Julien Drouet, blur redacted by me (with permission) in an attempt to keep this blog reasonably clean. I’ll bet you can figure it out anyway. This is especially funny in the genteel medium of cross stitch.